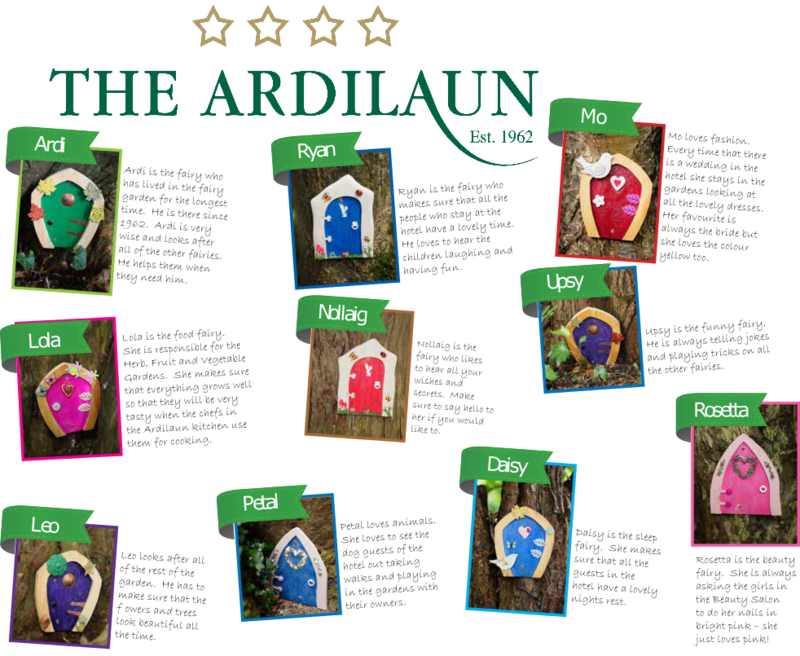 The Ardilaun Hotel in Galway City has announced news that a Fairy Family have set up home in their garden and an informative trail map of The Ardilaun Fairy Garden is now available for all children dining and staying at the hotel. The enchanting gardens at The Ardilaun are an ideal location and we can see why the Fairies chose this secluded garden with huge old oak and maple trees as a perfect place to set up home. It is said that the Fairy Family have been secretly living there since the 1800’s. The Fairies, previously unknown to the public, play an important role in the life of the hotel. 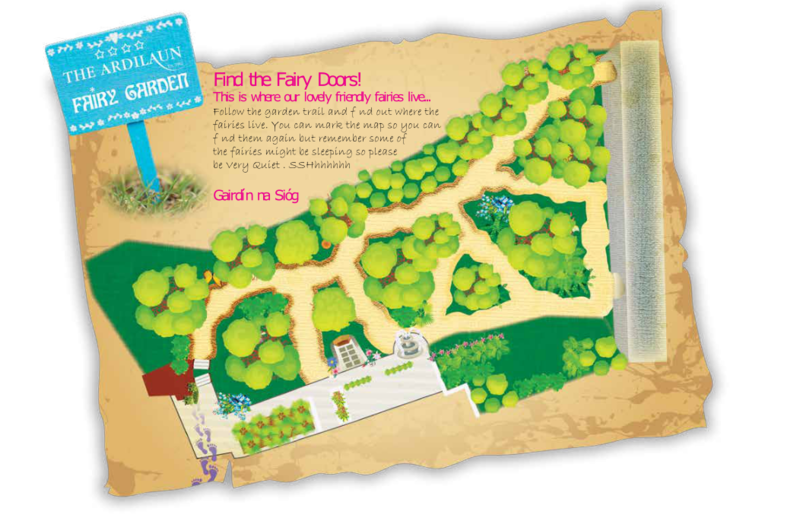 As part of the Fifty-five years celebrations at The Ardilaun Hotel, a Fairy Garden trail map was launched. This is available for children and families staying on holidays at the hotel or children who dine in the hotel in the Camilaun Restaurant or The Ardilaun Bistro. When visiting The Ardilaun Fairy Garden, the fairy experts advise to tiptoe and to stay really quiet when out searching as you might have a chance to spot one of the beautiful glittering fairies or see their trail of magic fairy dust. The fairies picked the safest part of the garden to the rear of the hotel’s garden patio near the fountain at The Ardilaun Hotel, away from the car park. This is definitely a big attraction in the Summer. All families who stay at the hotel will be given a free map to follow the trail which will be both fun and informative for both young and old. Children can read about the ten different fairies and their personalities and interests. There’s Ardi the fairy who is the oldest and wisest fairy who looks after all the other fairies. Nollaig loves to listen to all children’s wishes and secrets. Lola loves food and Leo looks after the garden. Daisy the fairy is very important as she ensures all guests sleep well at the hotel. Upsy, the funny fairy loves to make people laugh and tells jokes and plays tricks. Ryan enjoys seeing children having fun and he ensures that all the people staying in the hotel enjoy themselves. The map will guide you around the fantastic trees where you will discover clues and traces of where the fairies live as well as beautiful trees from Elder, Yew, Oak, Beech, Sycamore, Hawthorn, Ash, Lawson and Cyprus as well as wild garlic, ferns, fuschia plants amongst others. The map also includes specially designed puzzles, word search and colouring. All children that attend The Koala Kids camps are running throughout the summer will be brought on a special guided tour of The Ardilaun Fairy Garden.